The brief required the design, build and install of a secure storage space within the domed rotunda of the Four Courts to be completed within 3 weeks. On a practical level the structure was to protect large carved stone capitals prior to them being hoisted up through a hole in the dome located over the centre of the rotunda. 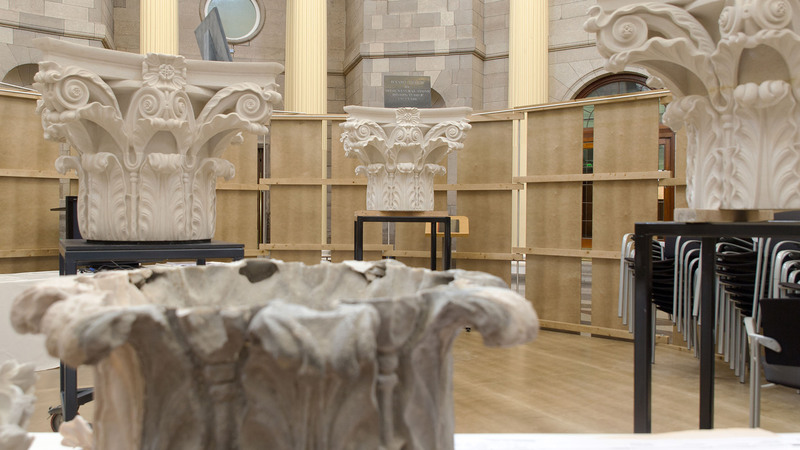 The interior of the structure was to accommodate the viewing and inspection of the capitals by the OPW and the Court Service. The exterior of the structure should inform the public about the work being undertaken. 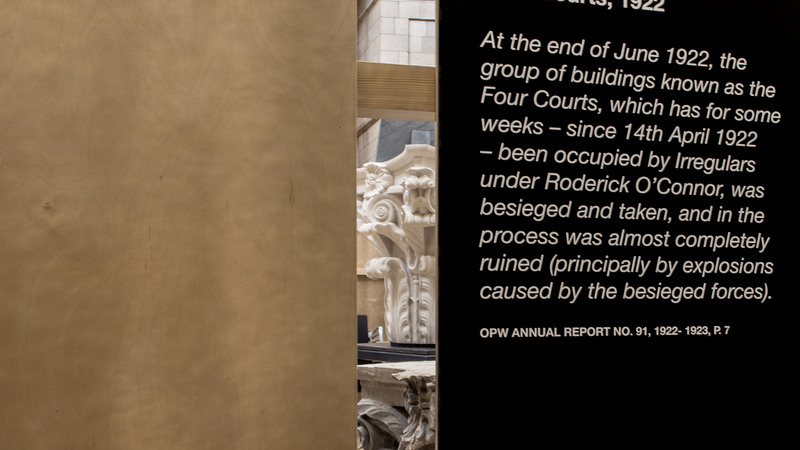 While the timeline enforced its own limitations, the real challenge was designing a bespoke structure from off-the-shelf materials that felt appropriate within the scale and grandeur of the rotunda, while drawing attention to itself as a noticeboard, blending into the room, and allowing the rotunda to continue to function as a busy public space. A key consideration in designing the exhibition was to acknowledge and work with the existing patterns and colours of the rotunda. Analysis showed that the floor pattern is divided into 16 segments, creating a circle with a diameter of just over 7.5m at the specified edge for the storage unit. Keeping in mind that no part of the structure could be fastened to the floor since the Four Courts is a protected building, referencing this circular floor pattern seemed logical due to the potential structural stability of a circular design. The allocated budget, timeline and required storage size of the structure stipulated that the design employ a cheap, quick and easy to build system. The result is a modular system that manipulates standard off-the-shelf components to create 16 identical panels. When the orientation of the panels is alternated they combine to form a folding screen. Connecting each panel is a rod which allows the panels to be rotated and adjusted on site to precisely match the floor pattern. Once the panels are correctly aligned one can restrict their ability to pivot with a few screws. By removing one of the rods, two panels can be moved to create an entrance into the structure. From the exterior, the panels are constructed to allow the public a view into the space without compromising on security. The modular structure simultaneously creates a framework within which to apply graphic panels. 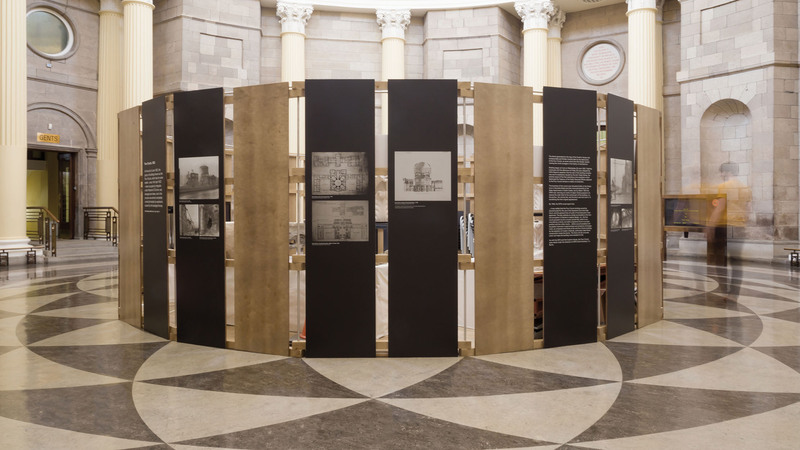 This framework allows for a very flexible use of printed material, meaning that it looks complete regardless the number of graphic panels installed, and allows for additional graphic panels to be added as the restoration work progresses. While not part of the brief, the client can easily repurpose the structure in the future since the modular panels and connecting system lets it adapt to various shapes and sizes.